One of the most notably edible mushrooms in the world (the rank second statistically) and the third most cultivated mushroom, shiitake mushrooms can be found in just about any market and are easily implemented into all types of diets and dishes. These potent mushrooms are healthy too. They help to fight off cancer cells and infectious disease, promote brain function, serves as an excellent source of B Vitamins, and boost our immune systems. They are so powerful due to their anti-fungal and antibacterial properties (immune system boost) and they help to reduce inflammation in the body and control blood sugar levels. Let's explore some key wellness components of these widely available and palatable mushrooms. Mushrooms as a species (the ones we do eat) have the ability to combat many diseases and boost the immune system since they provide such a potent range of important enzymes, minerals and vitamins. Consuming mushrooms have been shown to improve cell effector function and gut immunity. Key when we thin back to an important health quote by our man Hippocrates, "All disease begins in the gut." It helps by reducing inflammation in the body. Shiitake's have also been studied to have antimicrobial effects particular its affect on gingivitis. The results of the study showed shiitake mushrooms had the ability to lower the number of pathogenic organisms without affecting the organisms associated with health in the mouth. B Vitamins! Shiitake are rich in the brain boosting vitamin. B Vitamins also help he body to support adrenal functions and turn nutrients into usable energy (absorption). They also help to balance the body's hormones naturally and can help to break through brain fog, promoting more mental clarity and focus throughout the day. A lack of B Vitamins can cause fatigue, feeling sluggish, unhealthy blood cells, and negative adrenal effects. Avoid deficiency (important for vegetarians) by adding in more shiitake mushrooms to your diet. The key component, Lentinan, within the shiitake mushroom help to fight cancer cells and can aide in healing chromosomal damage caused by anticancer treatments (chemotherapy and radiation). This suggests to scientists and researches that shiitake has a true potential of being a natural cancer treatment. Studying the ethyl fraction from the shiitake mushrooms suggest that this component can inhibit growth of tumor cells with their mycochemical value. 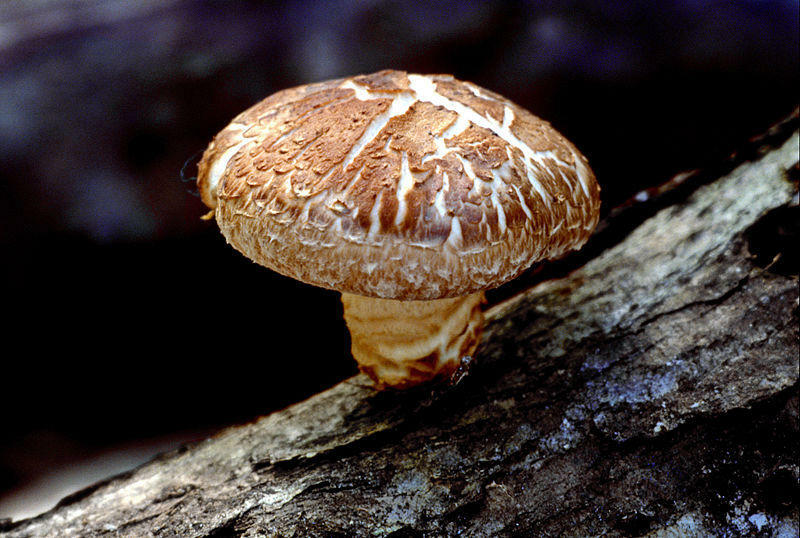 Shiitake mushrooms successfully inducted apoptosis, the process of programmed cell death. HUGE! Shiitake mushrooms contain a rich amount of selenium, which when consumed along with vitamins A and E can help to reduce the severity of acne and help to improve the scarring that often occurs afterward. The zinc within shiitake mushrooms also helps to reduce the buildup of DHT to improve skin healing. The sterol compounds found in shiitake's interfere with the production of cholesterol in the liver. They also contain phytonutrients that keeps cells from sticking to blood vessel walls which potentially forms plaque buildup. This helps to maintain healthy blood pressure and improves circulation. How best to consume Shiitake Mushroom? How can I count the ways? Shiitake Mushrooms are an easy addition to any diet. They are highly palatable and have a rich meaty texture. Stir them into a main dish, include them on the side mixed with greens, saute them on their own, dice them up small and include in a veggie patty, add to soups or stews, in eggs, or salads. They have a woodsy, meaty texture and can be bought raw, dried, or cooked.